For this baby quilt you will find all the measurements here. Instead of hand quilting, I thought of tying this quilt with knots for a change, as I already did twice in the past : here and here. This way of binding, plus the very light poly batting, gives as a result a very fluffy, light and comfy baby quilt. I am really very pleased with it! And I think that the knots bring a funny touch for a baby. As I told you before, there are three babys to be born in my circle. This quilt is for the first one, expected next July : a little girl. I am pleased I finished it, so that I can bring it with me to France next month. The two other babys, one boy and one we don't know yet boy or girl, will appear in autumn, so I will prepare their quilts when I come back from France, end of August. My absolute favorite kind of baby quilt! And this one is so dear from the use of your fabrics and the tying..another favorite! Just lovely!! It is beautiful. The ties will be fun for baby to feel. I like the idea of loosely quilted pieces with the light poly batting. I have baby quilts to make for twin girls soon. I may use your trick! Les couleurs sont très douces pour une petite fille ! Très joli choix de tissus !! Et j'aime beaucoup la manière toute simple de lier les épaisseurs avec les noeuds ! This is absolutely wonderful. I think I just have to make up my mind to start. It's kind of hard sitting behind the machine too long because I got the ChikV a few mths ago so it's not easy at all. But I'd like to one day. Encore un baby quilt so pretty..qui va ravir Maman et BB...en attendant c'est nous qui sommes sous le charme devant tant de fraicheur !!! 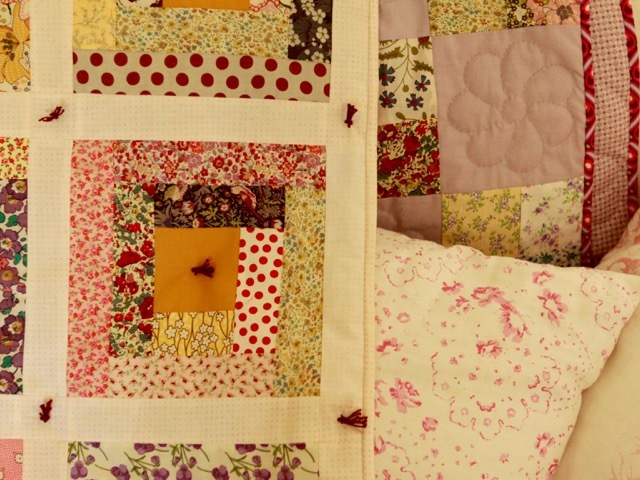 Oh I do so love this quilt Christine! You have such a way with combining beautiful fabrics. I love how the knots pick up the bits of dark red in the fabrics. And the golden centers are just so perfect. I too might borrow your idea. (How many times I have thought that when looking at your work!) 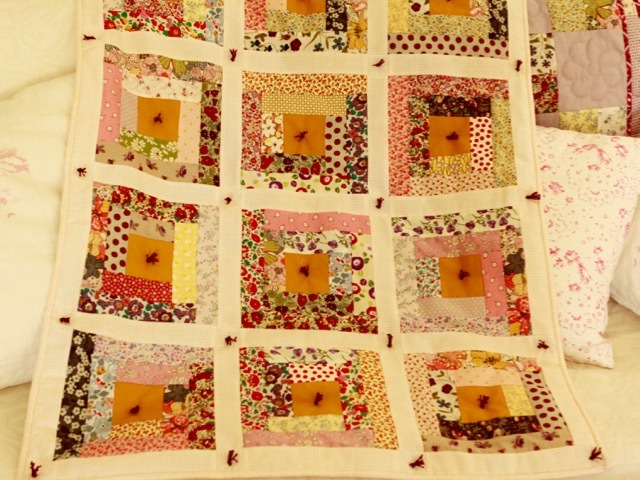 If this quilt wasn't for a precious little one, it would be very hard to give away. A really lovely quilt, well done Christine. The fabric choice is perfect! Lucky little baby!! How perfect for a soon to arrive little girl! Sits a lovely little quilt. I can just picture baby fingers playing with those little knots. Beautiful. It has everything I like Christine. Looking at it makes me happy! Christine it's a lovely baby quilt that will be loved a lot. This is a wonderful baby quilt. One of my grandmother's always tied her hand made quilts. I love your quilts. I always tie my baby quilts because my grandchildren like to sit and twirl them while drinking a bottle. You are very talented, thanks for sharing it will me. I love the tied quilts. Somehow they just seem warm and cuddly. Memories of childhood. Great finish. Those little knots will indeed be a fun touch for baby. What a great quilt. And I love that you tied it with knots. So cute! So sweet! I am sure it will be cherished and loved. 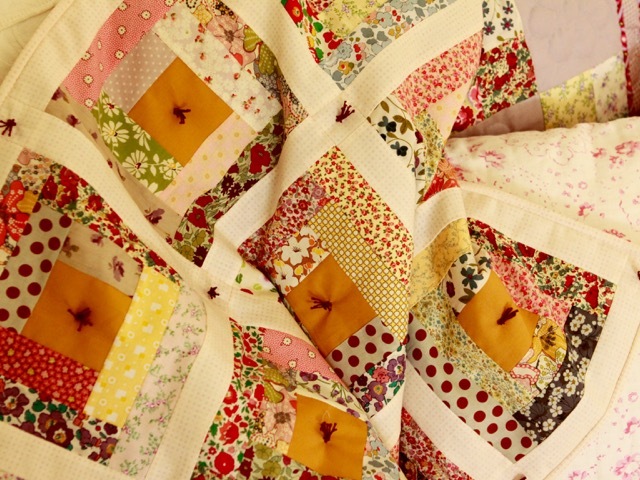 Tying a quilt is on my "to do" list! 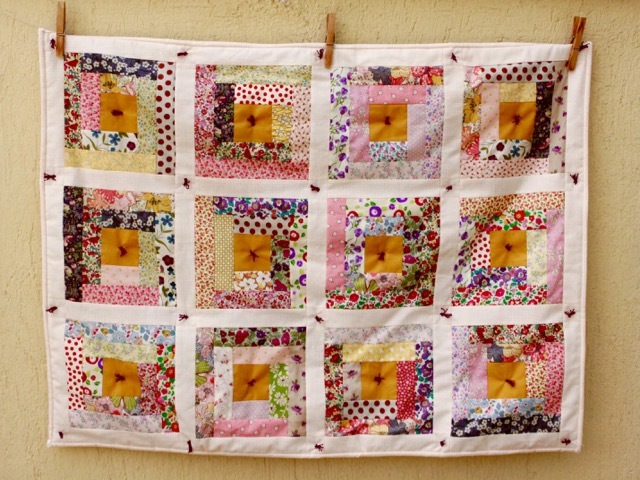 Very nice baby girl quilt! Lucky baby! Very Pretty Fabrics....a wonderful quilt, love the ties. Very adorable. Thanks for sharing with Oh Scrap! Oh my goodness Karen. I absolutely love your log cabin quilt. 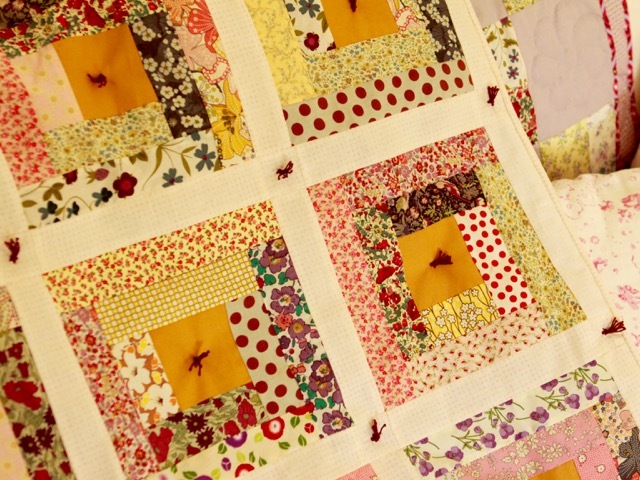 Log cabin blocks are one of favorite blocks to make and you have chosen the more beautiful fabrics. Gorgeous finish. 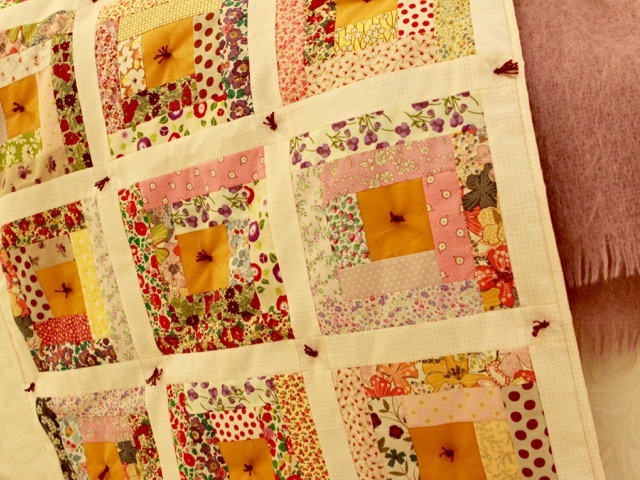 A very very pretty quilt! Love the way you tied it too!